The Luvis L200 Surgical Light’s led technology helps the operating room light stay cool when in use. The standard recommends not to exceed 1000W/m2 but all of the Luvis surgery lights irradiate far less than the standard requests. The color temperature adjustment feature allows three steps of color temperature (3,800K / 4,300K / 4,800 K) to be selected which helps surgeons find more suitable and comfortable lighting conditions. 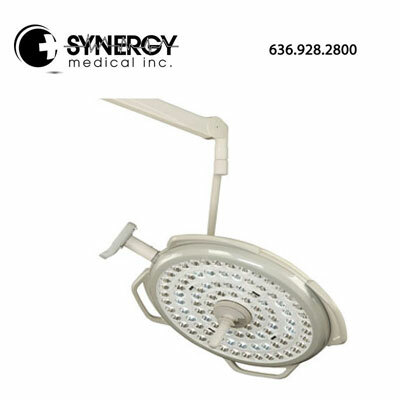 The L200 surgical light has an excellent dilution effect of 75%-100%. 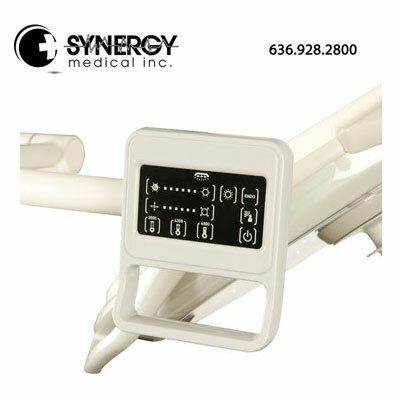 The L200 LED surgical light adopted a touch sensor panel which allows surgeons to control the light intensity, focus size and color temperature with only a single finger touch. The control panel is synchronized with sub-handle for the user to approach the control panel easily during the surgery, while the central grip will help surgeons to concentrate on the surgery at hand. The depth of illumination offered by the L200 performs at a higher level of Ec x 60% : 85cm and Ec x 20% : 150 cm. The L200 Mobile Type operating light comes with a lithium ion battery pack which is fixed to the mobile base and casters. This battery should be replaced every 12 months (may vary according to usage). Charging for the battery is easily indicated by the charge level indicator which displays 0%, 25%, 50%, 75%, and 100% to indicate the current level of charge. After a full charge the L200 Mobile Type surgical light can be operated up to 3 hours.